Since the last update you've read a lot about Russia which we hope you enjoyed. 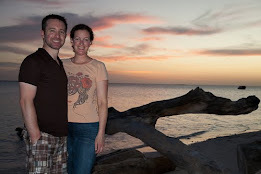 We sure enjoyed sitting on the beach, in tropical weather, recapping our winter adventures. 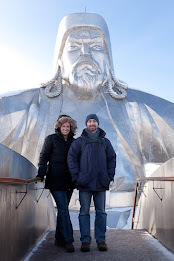 We have a few more posts on Mongolia coming soon to round off the journey. 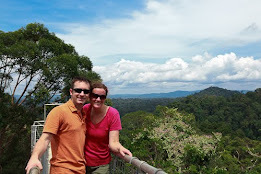 So what have we been up to in Thailand? Well, unlike our normal travels, not much. 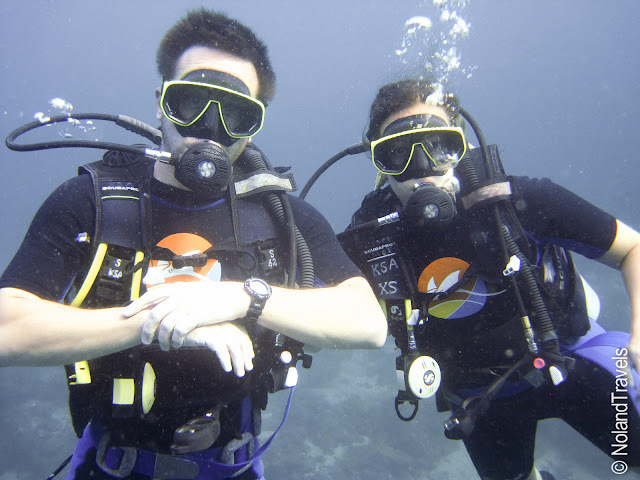 We passed our advanced open water diving certification and then sat on the beach and went diving nearly every day this month. 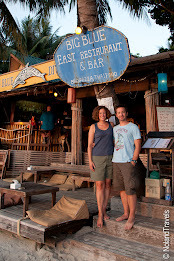 In that time we've nearly hit the 50 dive mark thanks to quite a few dives off the island of Koh Tao and a live aboard dive cruise to the Similan Islands where we racked up 14 dives in 4 days. The highlight being Richelieu Rock which we now understand why it's so highly rated. It was amazing! With the month coming to a close we figured it was time for another change. This time to India. We will hit the ground tomorrow afternoon in the city of Kochi, in the very southern state of Kerala. 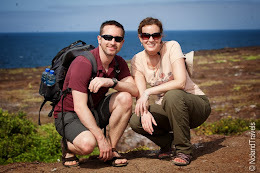 During the last month we've been off the grid some. However, we haven't lost track of time for to long and having been keeping up with March Madness. We are just going to have to find a way to watch the game. It'll be on Sunday in the early morning hours India time. 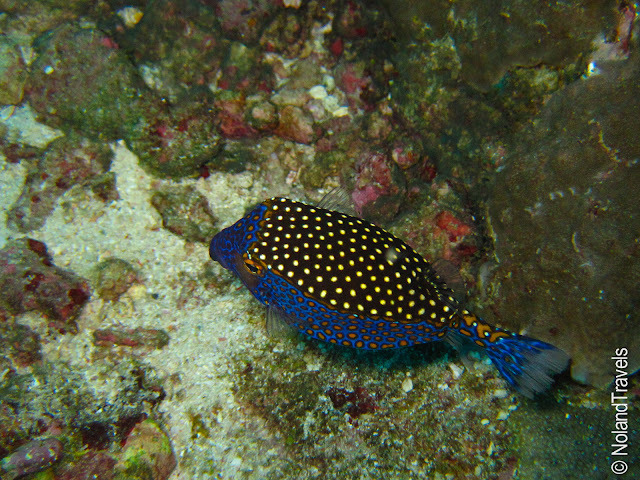 Diving has really struck a chord with us, so I'll leave you with 2 of our newly found favorite fish. 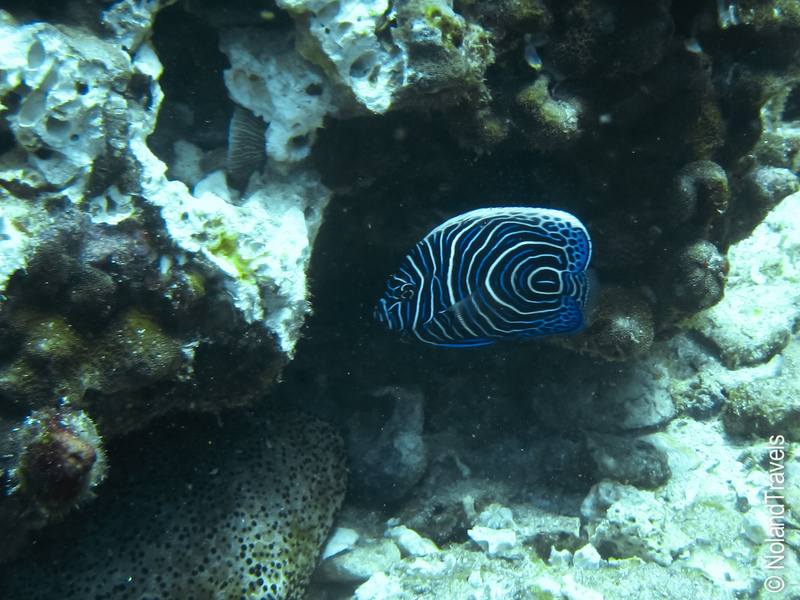 Below you'll find a Spotted Box Fish and the psychedelic juvenile Emperor Angle Fish (more amazing because they are the stunning black, white and blue as juveniles before they become this). We only saw one of the latter and it was a great moment! I had been going on to the dive master that I wanted to see one of these for 3 days and he just wasn't hopeful. Then just after our initial decent at Richelieu, he looked at me making a rocking baby sign with his hands, followed by making a circle with his finger over his head. I looked at him in disbelief. Had I had translated that right - baby, angel fish? Nah, I thought before swimming down to take a look. A big burst of air flew out of my regulator followed by throwing my arms straight up over my head. There it was happily swimming around a rock near the bottom. It was just spectacular! That's all from here. 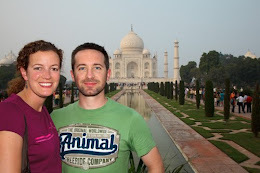 Feel free to pass along any India tips and suggestions. Happy Travels! Quote of the day, for sure! Konstantine and his words of wisdom are such a legend. Well, I guess we need a story to put that quote in perspective, so here it is. 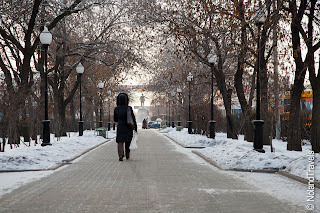 To be blunt, Yekaterinburg was cold, which made the idea of another day city touring a little unbearable. Ice cycles forming on your beard are a novelty at first but full days out in that weather are tough. 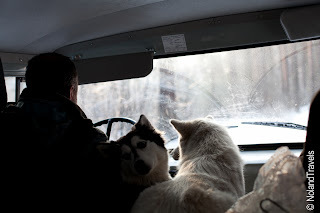 On the ride home from dog sledding we were talking to Konstantine about all sorts of things, his take on local politics, the Cold War and all things Russian - even a little about Kentucky. Well, ice fishing struck a cord with him and he said if we wanted, he knew a local expert that could take us ice fishing tomorrow. He said he'd go with us which, come to find out, would also get him out of some shopping with his wife. Sounds perfect, what time tomorrow? Bright and early, before sunrise, he picked us up and introduced us to his local expert - his FATHER! First things first, bait! 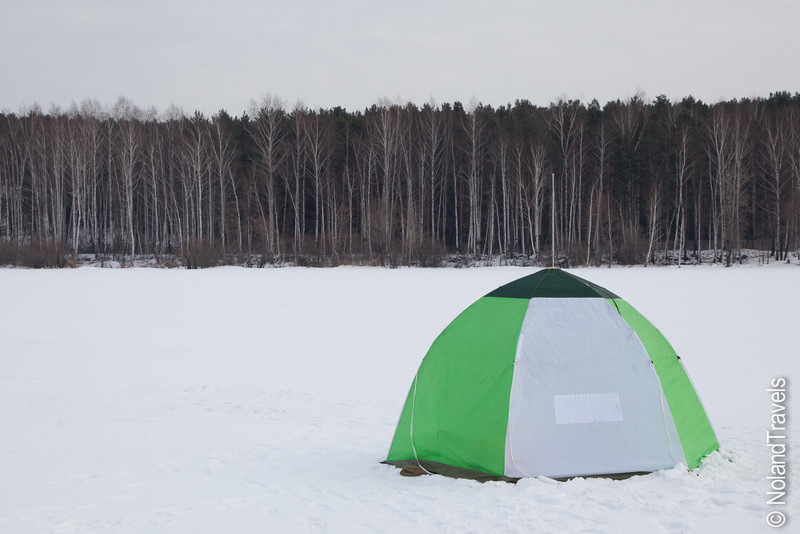 Ice fishing is an extremely popular hobby at this time of year in Russia. There are bait stores all across town but the favorite was a specific shop which is always the first stop for our local expert. It was a little corner shop full of fishing equipment where we picked up two small canisters of tiny shrimps and larvae. 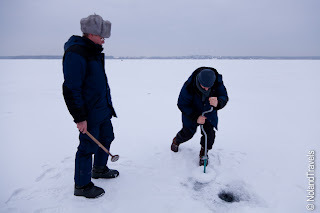 Our fishing hole would be the frozen Lake Sharkash, just outside Yekaterinburg. Luckily the weather was "warmer" than normal, at a blistering 19F (-7C) with light wind! Even still we had to borrow some heavy duty clothes from Konstantine to be able to sit on the ice all day. I donned a huge coat lined with lambs wool and we both grabbed some serious mittens with fur inside to keep our hands nice and toasty. Walking onto the ice with our new gear, we couldn't help but wonder how cold it would be. 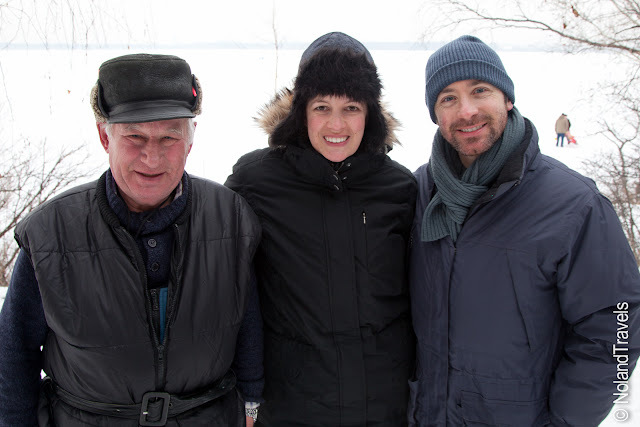 Plus the idea of walking on a frozen lake is just not natural for us. Stepping off the grassy lake edge on to the snow that you knew became the lake was a little nerve racking at first. We even stepped over some fairly deep cracks as we made our way towards the middle of the lake. We made a bee line for a hot spot that one of their friends suggested, in line with a certain little house and a black pole on the shore. Konstantine pulled out the big metal hand-crank drill and quickly drilled a 6-7 inch wide hole in the ice. The ice was about 3 feet thick before you broke through to the water. We needed two holes so he handed me the drill and I successfully cut a second hole in the ice. 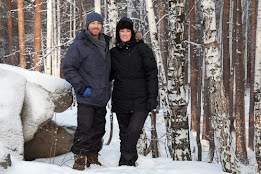 So how do you stay warm on the ice besides heavy duty clothes in this day and age? Pop-up tents! They set up as easily as an umbrella. Before we knew it, we were settled into a tent ready to fish. The difference was incredible, some wind protection and shared body heat in a small space made all the difference to help stay warm. Now for the poles. From my fishing days with my grandparents on Kentucky Lake, I had a certain sized fishing rod expectation in my mind. But that was not the case today; Konstantine dug out two of the smallest poles imaginable from his bag. They were no more than 12 inches long. At first I almost didn't believe he was serious, but he fixed the sinker in place, attached a small cork floater, baited the 2 hooks and dropped it through the ice into the water. 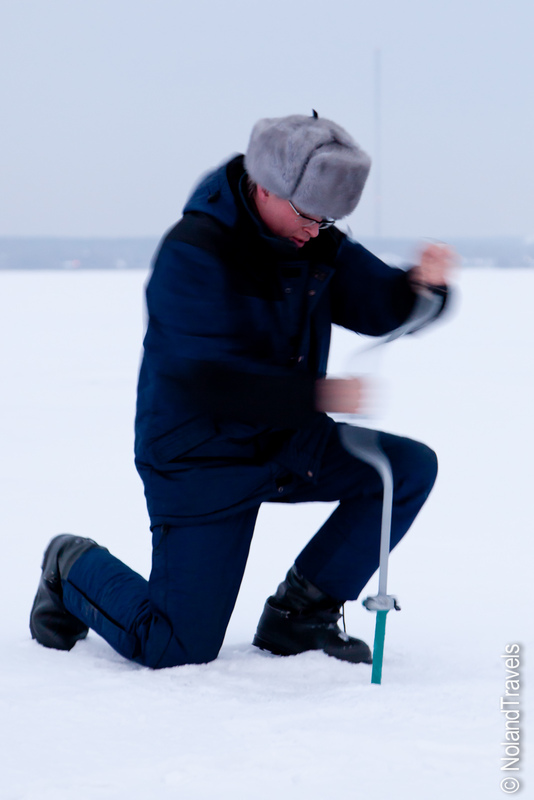 "The cork is the key", he said laying the rod and reel on the ice next to the hole. "All you have to do is wait for the cork to move, grab the pole and give a quick pull up". Ok this is new, but hey, when in Russia, do as the Russians. You just need to keep in mind that we aren't after big fish. Just small tasty ones. 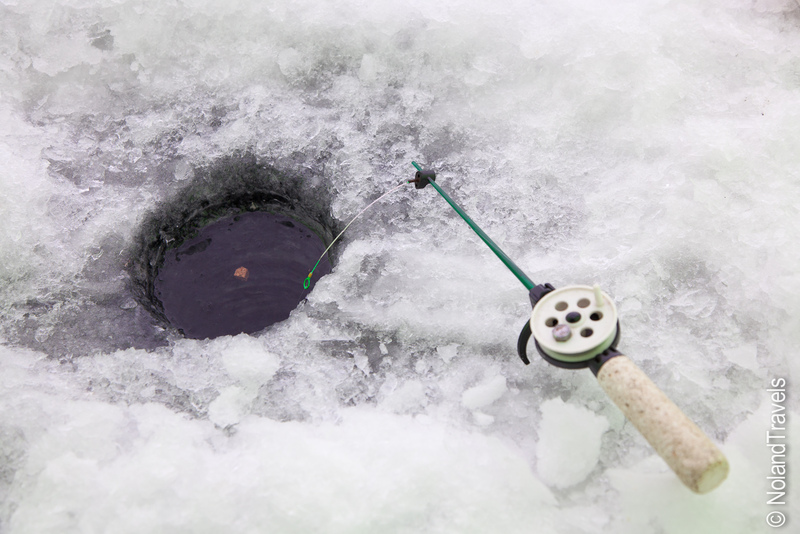 One ice fishing tip - breathe a breath of warm air into the bait canisters before sealing them up. This helps keeps them from freezing which increases your chances of landing fish. As we finished setting up, Konstantine called his Dad over (who had set up his own small tent). He leaned in, approving our setup before promptly setting out some snacks for us. He grabbed his knife and cut up some hard boiled eggs, placing half an egg on a cracker then topping it off with a big slice of red onion and a slice of seasoned pork fat. Looking at it strangely we knew we couldn't say no and honestly we were very confused until he added the final ingredient - vodka! 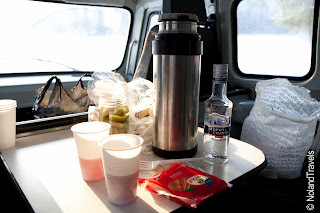 Konstantine explained that a vodka toast was customary to start fishing. His dad set up little cups and poured each of us a shot (Konstantine passed because he was driving). We downed the shot and chased it with the pork fat and egg cracker. The chaser was tough to stomach but strangely fit the experience. As soon as we downed the drink Konstantine dove for one of the fishing poles, yanking it up and catching a fish. I kid you not, magic! Then rather matter of factly he said, "fishing without vodka is impossible", as we all burst out laughing! We quickly had another shot and cheers'd to good fishing and new friends. Then as fishing goes, we waited, we watched, we bounced the fishing line, had some nibbles, etc. Steph and I both caught a couple of fish each before lunch. His dad was having a little more luck with his two holes so after lunch we swapped tents. Literally as soon as we sat down, Steph's line bobbed and she gave it a yank but the line seemed empty. Then seconds later it bobbed again and she yanked again, feeling something for sure. 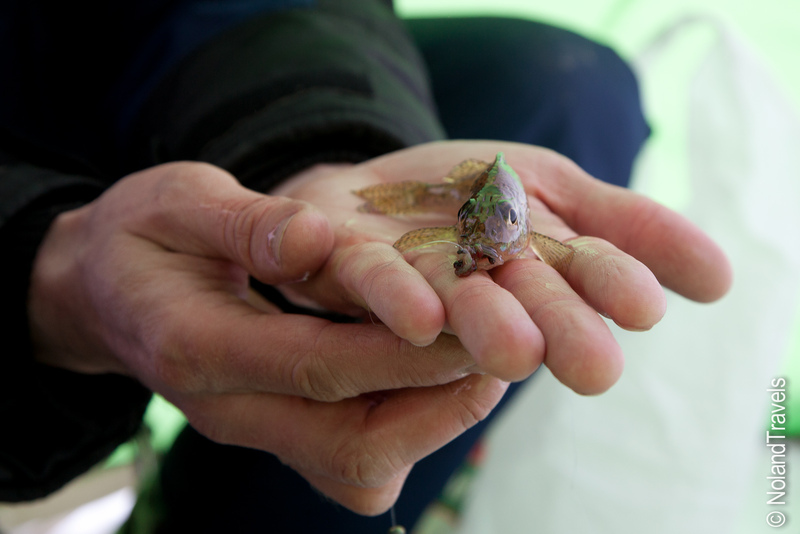 We pulled up the line just to check the bait and were surprised at what we found…a fish eye! Yikes - that must have been what she felt when she pulled the line! Then my line bobbed and I instantly pulled up another fish. With fishing in order, Konstantine left to go talk to his dad. It didn't take long before Steph and I simultaneously pulled up yet another fish each! I un-hooked Steph's fish and with the bait mostly still on the double hook line, she put it straight back in the water, and before I could finish un-hooking my fish Steph pulled up another! The local expert had indeed found a better spot. With the cold creeping in and having caught enough fish for them to make fish soup we were about to call it a day. Steph's line was baited one last time and Konstantine said she could try to catch the last fish of the day. We'll you know Steph, set her a challenge and its game on! Even with all of the extra clothes the cold was really sinking in by the end. Feet especially. We capped off the great day by warming back up in our hotel room. That night "late checkout" would take on a whole new meaning. 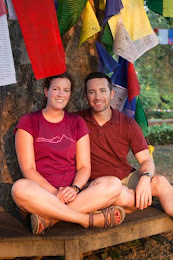 We would be checking out around midnight to catch the long leg of our trans-Mongolian journey. With some time to kill and not wanting to go to sleep, we needed something to do. 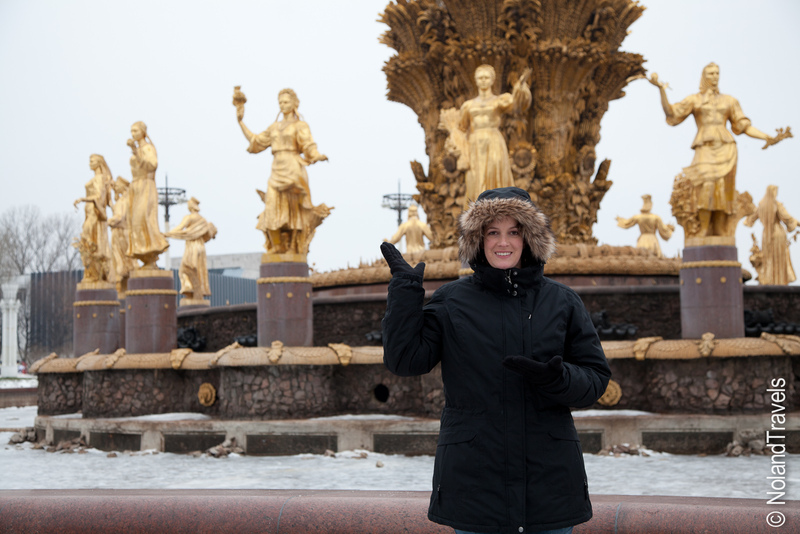 Very similar to the famous ice festival held each year in Harbin, China, Yekaterinburg does their own version. Each year an exhibit is setup so we wondered down to the large town square which was filled with ice towers, bridges, slides, amazing sculptures and even an ice-bowl for the young kids to slide around in. To top it off most of it was lit up from within with lights and the entire scene sparkled. Being a little too cold to take photos we just soaked up the scene. The only thing left to do was a quick grocery shopping trip to stock up for the train. 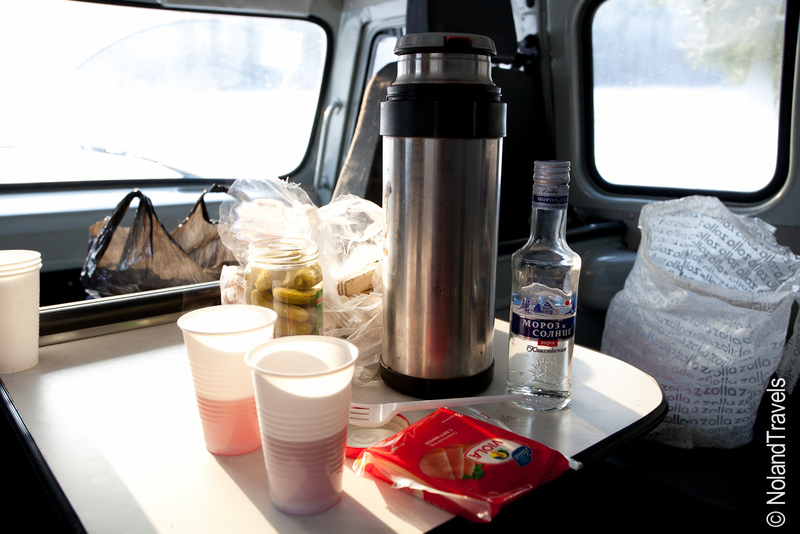 Pot noodles, snacks and Vodka in hand we checked out of the hotel ready for the longest portion of the train journey. A staggering 4 nights and just over 3 complete days. 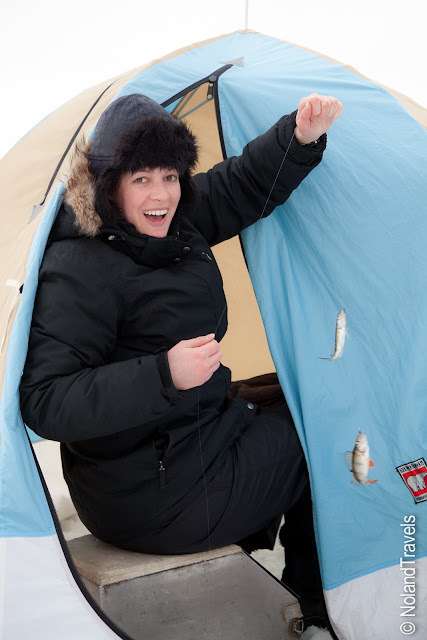 Finally, here is a picture of the local expert who helped us have a entertaining ice fishing experience. We've always wanted to go dog sledding so when this came up as an option for our included excursion we jumped at the chance. 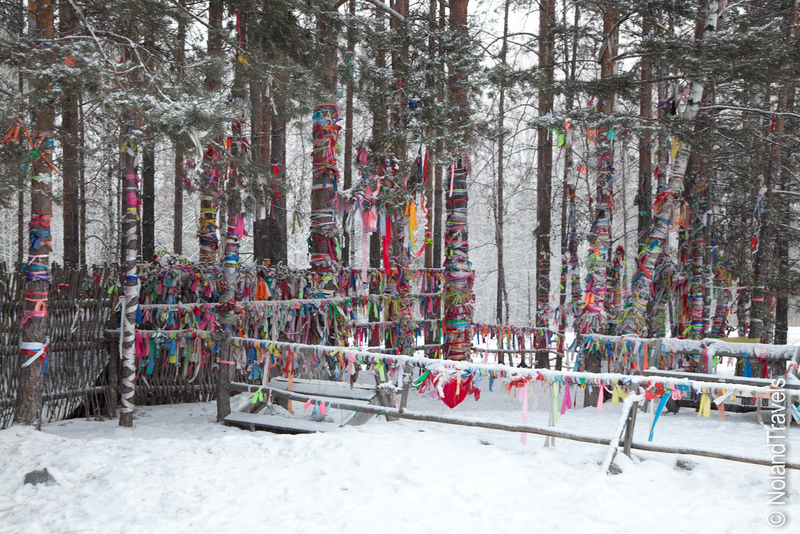 Konstanine picked us up early and we headed out of the city to a snow dusted highway lined with snow covered trees where the forest of the Ural Mountains really took hold. On the way we made one stop at a monument that marked the continental divide between Europe and Asia. We played a little tug of war in front of the monument before learning about a marriage tradition that happens at the divide, prompted by a newlywed couple who drove up with white streamers flying and windows covered in best wishes messages. Continuing on, we soon turned off the highway and found ourselves on snow-packed, unmarked roads (we're really not sure there was pavement under the snow…). Konstantine even got himself confused on the unmarked roads and had to do a quick turn around before finally meeting up with a van in an empty snowy field. We were introduced to the musher who was fully bearded and famous locally for being in the Guinness Book of World Records due to some of his treks across Siberia. He had a young assistant who didn't speak English who helped with the sled. When we arrived the dogs were running around in what I'll call their "warm ups" - you know, dogs running loose in an open field. The introduction to sledding was simple and brief. They helped us secure the camera bag, showed us where to sit and stand, how to apply the foot break, then taught us a couple commands we'd need. "Haak", means go and "shhh" for stop. He said for them to work you'd need to really put force into the pronunciation, like this, HHHAAAKKK". Looking at us we repeated, "haakk". He shook his head, no, "HHHHAAAAKKKK" he said very forcefully motioning to his stomach. 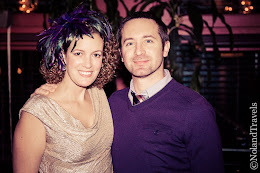 We did our best "coughing-up-a-hairball-haak" which he gave a positive nod to and we were ready to go. The actual sled was only large enough for me to sit on and for Josh to stand at the back. 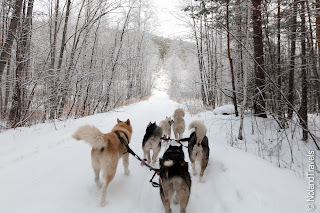 We had 6 lovely huskies guiding the sled all with different personalities. 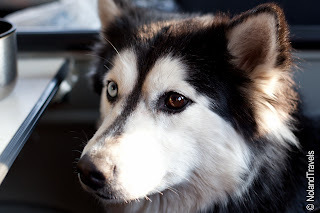 A large fluffy white husky was the alpha male lead dog who peed on everything. He was paired with a smaller, more reserved white husky with stunning blue eyes. We think she was there to help keep the lead dog calm. There was an older dog at the rear, paired with a large caramel husky who probably needed to be far away from the lead dog. They provided the rear wheel drive. In the middle was the young and "friendly" dog, Sarah, with one blue eye and one brown eye (shown below), paired with an average size/age dog who had gas! What a cast of dogs, now lets see if you can run! So, after a few last minute instructions, the musher untied the sled from a post. Instantly the dogs knew what that meant and began jumping and howling in excitement. 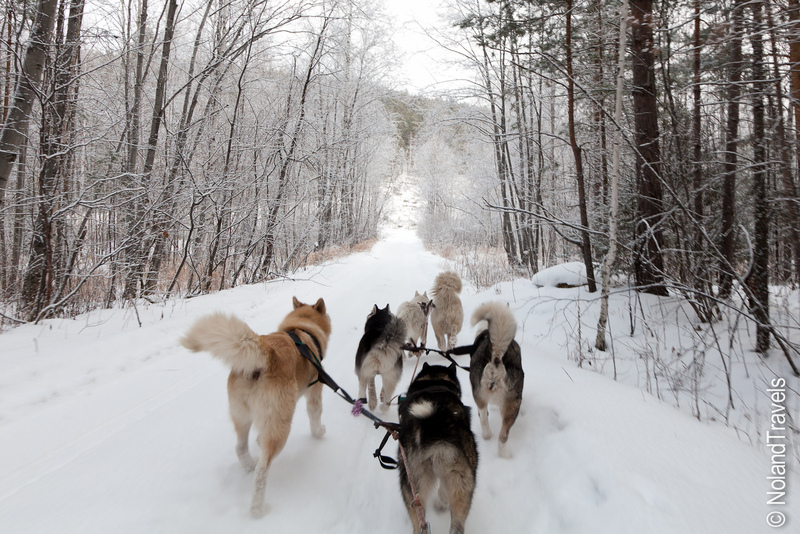 The sled lunged forward as we started to move. He hurriedly jogged to the van, as the dogs followed. He jumped in the driver's seat and hit the gas and with the dogs faithfully following we were off and away! As we cruised through the forest, I'm not sure the dogs ever really listened to us. They are only trained to listen and follow their musher who was riding in an off road van in front, so they naturally followed along. For most of the journey the van was out of view which gave us the opportunity to really enjoy the experience of sledding through a winter forest. I really want to say "winter wonderland" but it sounds too cheesy. 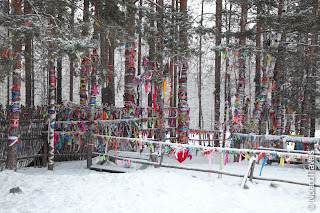 However, it really was absolutely peaceful and beautiful - so pristine and all covered in snow. On one funny note, a couple of times the lead dog would turn around and look at Josh yelling commands, as if to say, "who do you think you are? You aren't in charge here…"
We did have one near sled flip, as we rounded a corner we hit a small lip on the edge of the path, but fortunately Josh was able to brace us as we started to roll, keeping us upright until the ground leveled out again. It all happened so fast but I thought I was about to face plant in the snow with the camera! Whew, it was a close call but smooth sailing otherwise. We sledded for about 7km into the forest and then stopped for lunch. While he grilled our sausages for lunch, the musher suggested we climb a nearby hill to see some of the rock formations that make up the rich geology of the Ural Mountains. I had had way too much juice and water that morning so venturing away in to the woods to find a ladies room suited me just fine! I had a good laugh at the whole breezy experience - guys just have it way too easy! 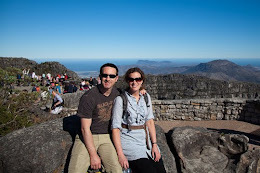 At the top of the hill was a large natural rock formation that dropped away on the other side. We took advantage of the snowy scene to get some fun pictures of ourselves. Knowing that the musher was cooking our lunch we then headed back down the hill realizing this was the first time we had both seen powder snow. The snow was sometimes knee deep and it was good fun to jump and whoosh down the side of the hill in the powdery snow. Back at the bottom, the musher opened the van door for me so we could sit inside for lunch. As I climbed in I was unexpectedly greeted by two of the dogs sitting inside on the bench being right at home! After we all got in the musher pulled out the obligatory small plastic cups and a bottle of vodka, along with a small jar of pickles. Good man! After downing the warming shot of vodka we tucked in to the flame-grilled sausages and pieces of cheese. Delicious! He even had dessert - small flaky wafers with chocolate layers! 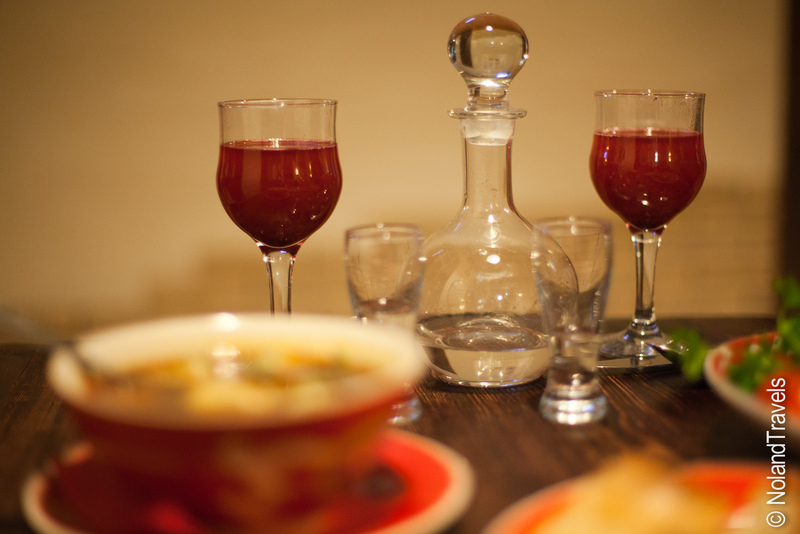 It's sometimes simple meals like this that are some of our most memorable! 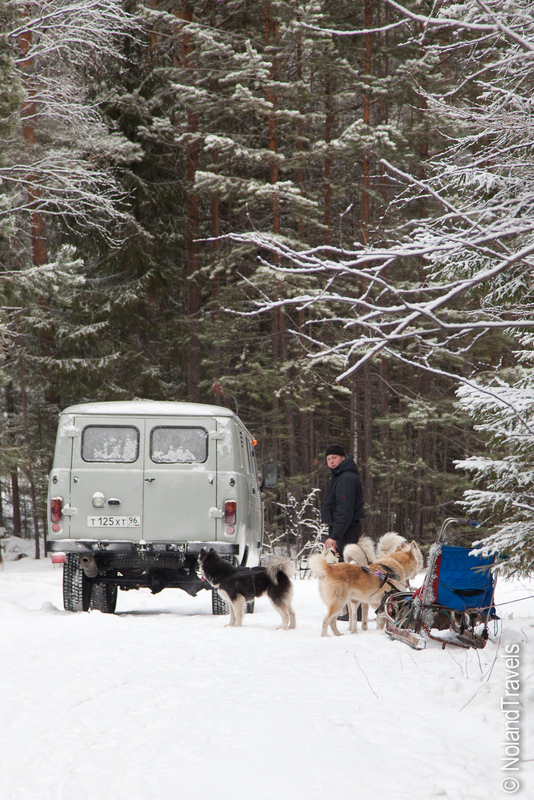 Sitting in a tiny van, surrounded by dogs, in a Siberian forest eating grilled sausages and drinking Vodka! There wasn't any sledding back to the start, but we didn't need any more. The experience was already amazing! 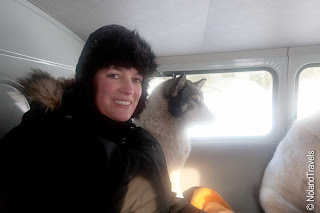 On the van ride back two of the dogs crawled into the front seat to help the musher drive home which was fairly funny as you can see. The older dog just napped with his head across my leg and one foot stuck out to brace himself for the bumpy ride back. The dogs took a well earned nap and we zoned out after the Vodka and sausages and enjoyed a seriously priceless ride back. To give you a better idea of the sledding experience, I put together this quick video. I broke it down into multiple takes so you can see how little the dogs responded to our commands. Yekaterinburg - the capital "just in case"
Departure from Moscow came too quickly but we were looking forward to some outdoor activities in Yekaterinburg and a longer train journey experience as a test run before the trip across Siberia. The loud speaker buzzed with the equivalent in Russian for "All aboard" as we stood in the train station, our bags in a pile on the ground in front of us. Our driver roughly translated, er, well motioned to his watch, then ushered us to the train and our designated carriage. Climbing on board we met our conductor and after a quick passport check settled into our cabin. For some reason there is always a little excitement boarding trains, especially ones you know you can settle into and just relax. Books (guide books and Kindles), iPods, a change of clothes, our silk sleep sacks and hand wipes out of our bags, we tucked them in the netting above the seats while waiting to see who might be joining us in the cabin for the 36 hour trip to Yekaterinburg. 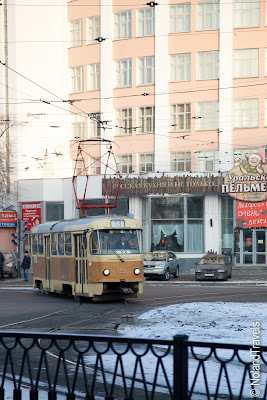 Exploring the car, it was quickly evident that this train was much nicer than the previous one to Moscow. The toilet is an easy gauge. It was sparking clean with the normal supplies that aren't always a given. As the clocked ticked down to departure, we were surprised to find only one other passenger had boarded our car. Yeah, I guess in the middle of winter only a few foreign travelers are willing to brave the Siberian winter and now that the Russian holiday travel period is over, its just not that busy. Oh well - our gain! Some much needed quiet time will do just fine. After a quick bite to eat in the dining car it wasn't long before we were both heavy eyed and making up our beds. Josh chose the top bunk so I happily settled in to the bottom bunk. We quickly drifted off to sleep helped by the cozy warm train and the soothing soft klickity klak, klickity klak and rocking motion of the train. The next morning we awoke to sunlight pushing through the curtain gaps and marvelled at the white expanse outside our windows. Every once in a while you'd see a small town with smoke billowing from the colorful wood structure and tin roof homes or kids sledding at the edge of town, waving at the train going past. Thanks to the endless hot water supplied by the samovar, we enjoyed instant porridge and instant coffee while admiring our morning view. Ok, so now we're on a train for a full day - what do we do? Well, in short, not much. We both spent some time staring out the window, snapping a couple photos and reading. After the fast pace of the previous days, we both needed to relax and this perfectly fit the bill. Before we knew it the conductor came knocking on our door, "20 minutes to Yekateringburg". Is the day already over? Yep it was sunset as we pulled into the station. 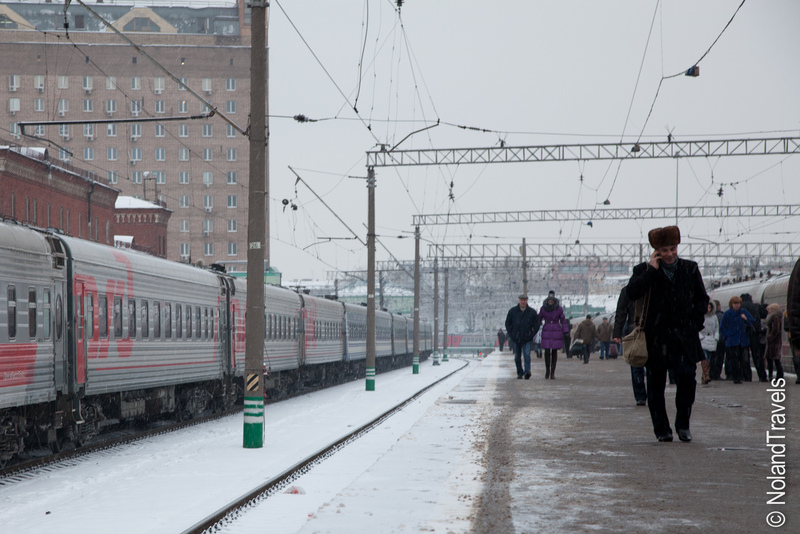 We grabbed our bags and stepped off the train ready to embrace the cold. 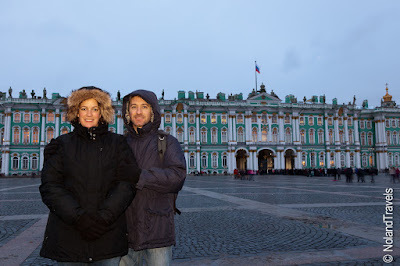 "Hello, Josh and Stephanie", a man with the iconic Russian fur hat said meeting us at the carriage door. "My name is Konstantine", as we shook hands. He would be our local guide for our stay in his home city. We wondered how he knew it was us stepping off but I guess with only 3 people in the train car it was fairly obvious. Driving away from the station Konstantine was instantly likable with very good English and an excitement to be showing us around. He took us to our hotel and helped us get checked in before outlining tomorrow's itinerary. This was easily the nicest hotel we'd been in so far- with lovely decor and all the amenities you might expect plus some other bonuses like decent priced house wine and free movies. The staff even played up the scene wearing some traditional clothing. Konstantine had given us a few dinner recommendations which we were keen to try out. Tonight, we chose the closest and ventured next door to a mall restaurant that served good local food. After sitting down we were handed Russian menus. The wait staff just smiled at us, not knowing a word of English. Ok, no English menus, no pictures, we can deal with this - action plan B! Josh ran back to the hotel for our guide books (thank goodness it was practically next door!) and we then spent 20 minutes comparing Cyrillic words in our books to those in the menu. We settled on something "pork", something "chicken" and some type of potatoes. Who knew how it would all be prepared but at least we knew what meat we were getting! Turned out Josh got pork in a creamy flavorful sauce in a skillet and I had a nice roasted quarter chicken. All topped off by a little Vodka and some sort of delicious cranberry juice drink as you can see in the photo. Whew! You can see us with the huge statue of Lenin in the center of town. At one point driving through town we saw one of those digital signs showing time, temperature, etc. Josh commented on the temperature (something around -15C) and Konstantine was quick to point out what the other figures on the sign represented: time, temperature, humidity and radiation levels. What? Yep - it's common apparently for some cities to have radiation levels posted around town. It was at 11. He said that was normal but it had been up to 20 before (but 20 is still safe, apparently…I asked!). Good to know! But still, radiation readings!? As previously mentioned, the city is well built up - clearly it was an important city in history that justified advanced dams, significant architecture and infrastructure. 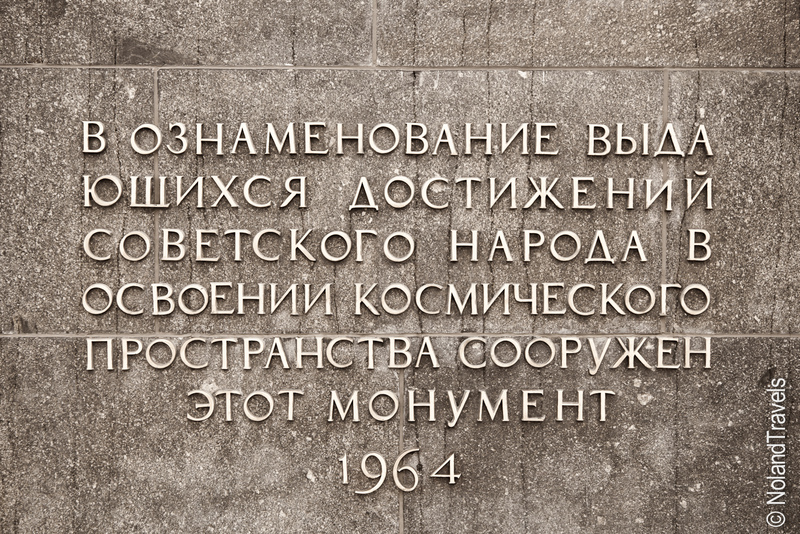 It was actually closed to visitors during the Cold War and only recently opened up due to its military past. Some of you will remember the name Gary Powers, who was an American pilot shot down near Yekaterinburg in the 1960's. Funny enough he was born in Kentucky. So with such a connection, we had to stop in the Military Museum where we could see a small fragment of his plane and pictures of some of his gear - a fascinating emergency pack of rubbles, cigarettes and jewelry for the ladies "just in case", I guess…! 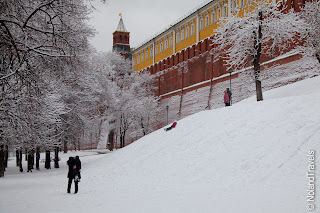 Back a bit earlier in history, 1918 in fact, the city was infamous for being where the last Russian Tsar, Nicholas Romanov, and his family were brutally murdered during the Revolution. The entire royal family was more recently canonized and a cathedral was built here in their honor in 2000 - 2003 on the site of their murder. It clearly was a new-ish cathedral but rather impressive since it was built in modern times and the artwork inside was quite good. Konstantine then took us to one of the tallest buildings in town so we could get a bird's eye view of this fascinating, industrial town. 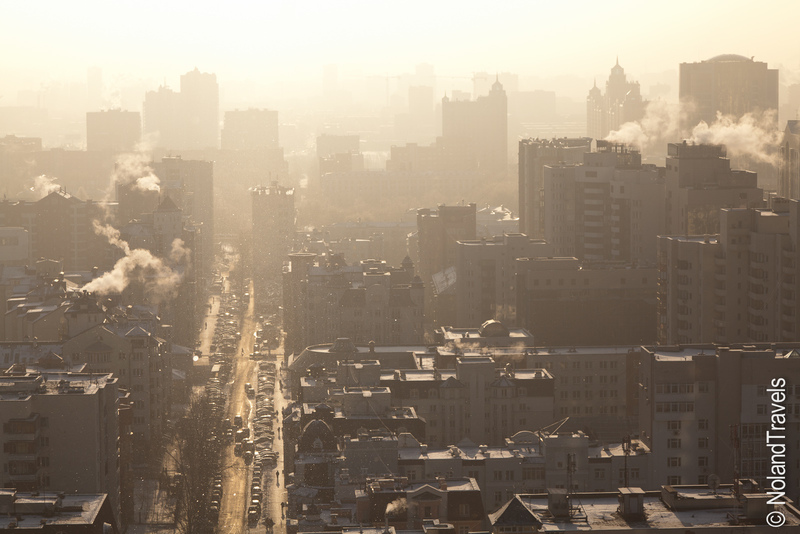 The view clearly showed the ultra modern buildings and beautiful historic buildings in the foreground, with it quickly fading to industrial sites and smoke stacks in the distance. We had a great lunch at a restaurant called USSR which felt as if you stepped back in time with kitsch decor and a machine gun mounted on the bar. Afterwards, we opted for the Mineralogical Museum - where you could see samples of the many minerals, stones and crystals that thrived in the Ural Mountains. We were a little worried when we were at the address and couldn't find it; nor could a nearby building security guard tell us where it was. When we did finally find it, we walked up stairs to find the place dark and a couple workmen with wood saws. A lady at the door indicated it was open and after our obvious hesitation, she turned on some lights and welcomed us in. It was pretty much a large room with a lot of glass cases full of minerals and stones, but after they handed us a handheld light (to really shine the light on some of the sparkly, reflective or translucent surfaces) we had an interesting wander around. Fortunately, it was a cheap ticket. 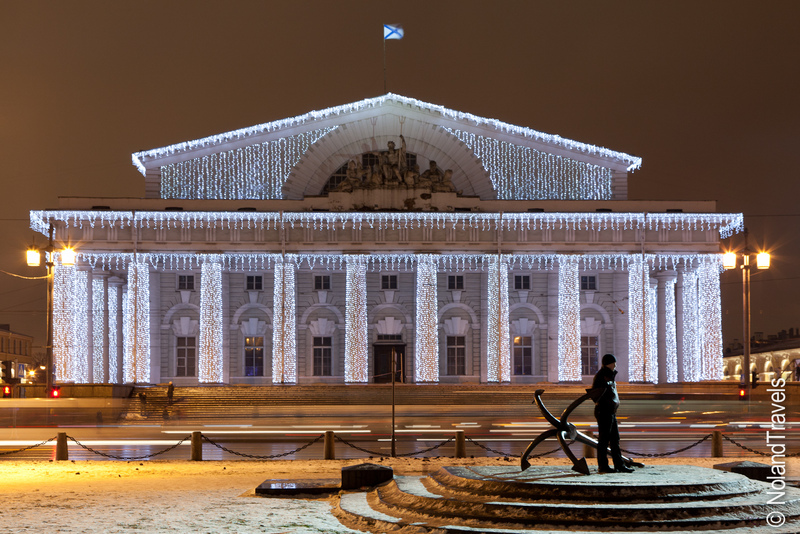 But it did go to show the richness of the Urals - you could understand why this city, in this geological location, was quite important to Russia. For having not prepared for visiting Yekaterinburg, we had a fascinating day full of interesting stories and sights. We rounded out the day by taking it easy back in the room - ordering a pizza and partaking in the free movies and a cheap bottle of wine (and as you might expect, the wine was one of those too good to be true things...it was indeed cheap)! 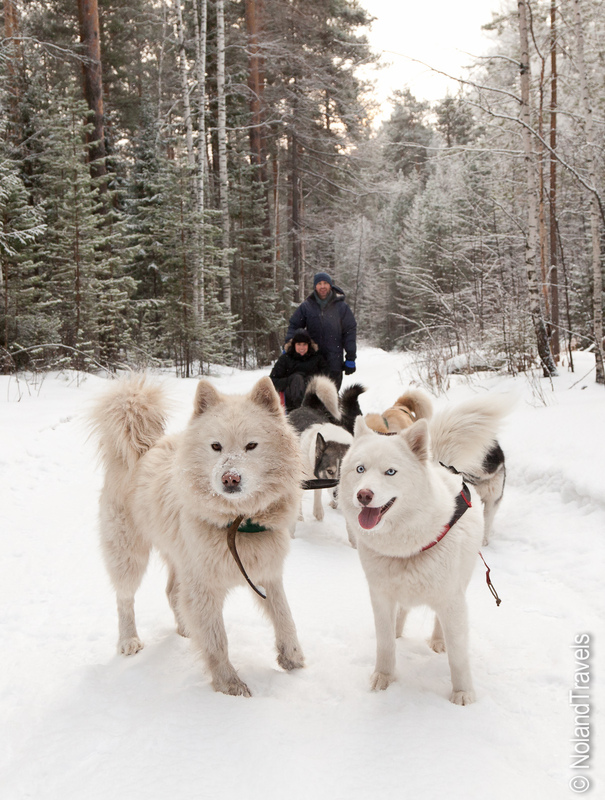 The leisurely night was important though because tomorrow we'd be waking up early to go dog sledding! 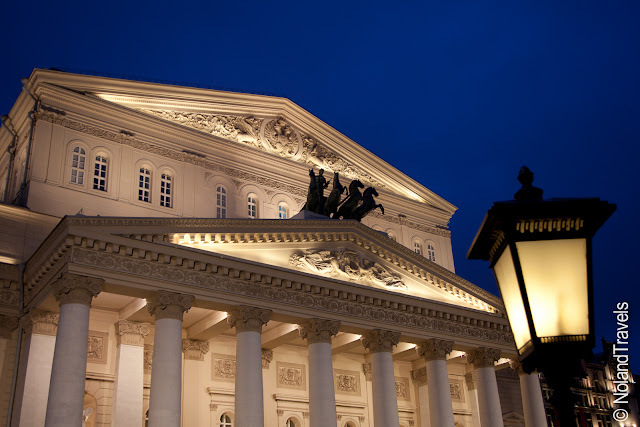 If you've heard this name then you must know that this theater is the home of Russian ballet and opera. The name literally means "big theater". 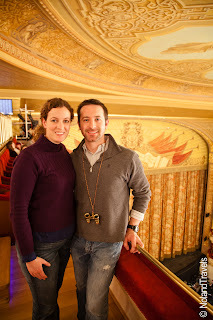 It has a rich past and although Josh and I aren't necessarily opera and ballet buffs, we were particularly interested because the famous main stage has been closed for over 5 years of renovations and just re-opened in October 2011. Our tour guide mentioned that the renovations came at a good time because after the project started, they realized the theater was in worse shape than they thought and was about to collapse! 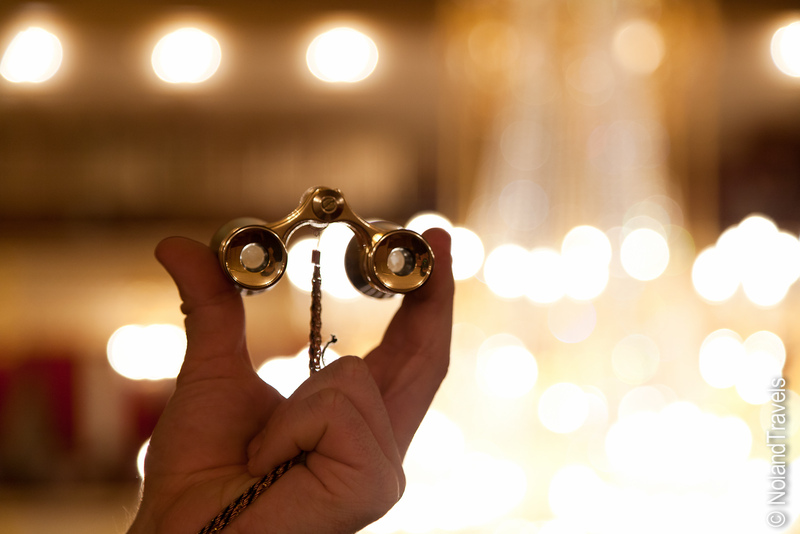 Therefore, we knew we needed to take advantage of this opportunity to see a bright and shiny refurbished Bolshoi Theater. 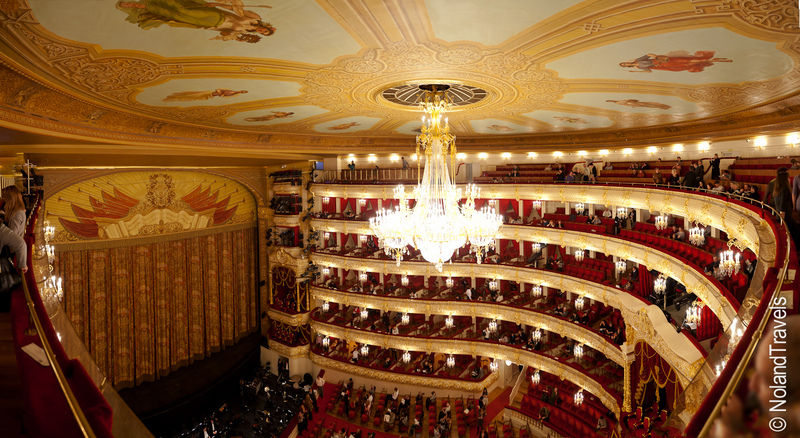 Like most things in Russia there are local prices and tourist prices and the Bolshoi was no exception. The cheapest seat in the house started at 4000 rubbles (about $125). I was googling away in our hotel room and ran across the reviews on tripadvisor.com where some travelers had just visited the Bolshoi and were able to score last minute tickets from the box office…and for just 100 rubbles (about $3)! So, that was our plan! 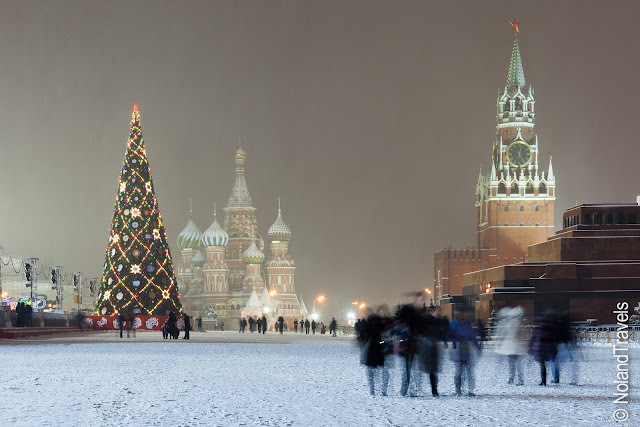 As it was the last couple days of the Russian Christmas holiday period and is, strangely, low-season for other tourists, we thought we might have a shot. So on Saturday night we headed to the box office about 2 hours before show time. We got in a queue and the two girls in front of us were just able to say they think this queue is for students only. We then went in the small box office room, big enough for maybe 40 people packed in, with 2 tickets windows on the left and 2 on the right and all signs in Russian. There was also a somewhat security guard letting in a few students at a time and pointing others in the right direction. He first pointed us to the windows on the right and we were quoted prices of 3600 rubbles…each. Eek - not much of a discount. Should we wait to see if they go down any more? What are those people now doing queuing at the windows on the left? They're not students. "Josh, go get in line!" Or rather the "pack" - there was not an orderly line but a pack of people. I feel I should explain a bit more about Russian queuing etiquette, which my friend Maria had warned me about. Personal space is not so important and sometimes there's a little pushing. Generally, they make note of who they are behind and who is behind them. There is also freedom to leave the queue and re-enter it where you were, which is often prefaced by them mumbling something to us in Russian probably letting us know that they'll be right back. So with that in mind we dashed over to the pack having no idea what we were queuing for! Everyone kept checking their watches and other people would come in the small space, squeeze through, ask what's going on, leave, come back, etc. There was also a ticket scalper hanging out in the room, approaching people quietly; I did see him slide a ticket to a lady in exchange for a 100 rubble note as her friends were already at the ticket counter (not the window we were waiting for). Maybe the scalped tickets are legit? Not worth the risk! This went on and on until we were talking to each other and the lady in front of us turned around and told us in perfect English that the tickets will go on sale at 6:30, a half hour before the show. She was visiting her mom but lives in New York - perfect - a translator for this craziness! So, at 6:30 the lady at the ticket window started handing out tickets and that was when the fun began - the surge of pushing forward - the little side arguments of who's in front of whom. Then it stopped and the ticket lady pulled a white sheet down over the window. Tickets were gone. There were only about 6 people in front of us. NO! Not wanting to resort to the high price tickets still available we decided we'd try again the next night…our final night in Moscow. So, on Sunday night we showed up smartly at 5:45, dressed in our nicest travel clothes, passed the student queue and went straight in for the last minute queue to find a horde of little old ladies - more people than the previous night! Oh no! We claimed our space and waited. The same scalper, in his Oliver Twist style hat, was lurking about. We figured he had an arrangement with the security guard as all other scalpers were out on the sidewalks. Then around 6:15 they opened the ticket window and boy, did those little old ladies surge towards it! There was a lot of bickering between them and with the security guard as one by one they handed over their 100 rubble note for a ticket. Then a lady in front of us in a fuzzy red hat got pulled aside to the closed ticket window just beside. I thought she was in trouble with the guard! And as we made our way closer the guard then grabbed us and put us behind the red hat lady. Why? What's going on? Then we noticed all the pensioners were showing little cards or passes - maybe the equivalent of the AARP in the US?! So, now third in a new queue, with my hands resting on the ticket window ledge, we waited again. More people were coming in, nosing around and trying to figure out what was going on as we waited again. We loved it that even though most of them spoke Russian they had no more a clue what was going on than we did! And finally, our window opened and we did indeed hand over two 100 rubbles notes in exchange for two seats in the level 4 stalls - score! We dashed across the now quite snowy parking lot, found our entrance door and made our way to the top floor where we checked our coats, rented the little opera glasses and then hit bar - for coffee and snacks (salmon on toast for Steph and salami on toast for Josh)! We could tell from the hallways that this place was going to be grand but it wasn't until they sounded the bells that we started heading for our seats and were in awe of the gild and glamour inside the main stage! A massive crystal and gold gilded chandelier hung at our eye level and the ivory walls and boxes were decorated in gilded decorative designs. Hopefully, the pictures show a bit of this. We lucked out with seats right at the railing. Although we had to be in a perpetual lean against the railing to really see we did have an unobstructed view. Josh asked as it was starting how long it was. Having been on the Bolshoi website the night before (and thanks to google translate) I remembered seeing a run time of 2 hours 15 minutes…or was that for the Nutcracker ballet (which was sold out)??? We also both realized as the music was beginning that this was most likely going to be in Russian, we had never heard of the title of the opera and I forgot to read the story synopsis online. So, expecting to be confused for the next few hours we were both pleasantly surprised to see English subtitles projected above the stage! Thank goodness because we would have had no clue! The story ended up being about Tsar Boris Godunov and the demons inside him that haunted him about being involved in the death of a child Tsaravich so he himself could get in to power. We read about Tsar Boris in our travel books and we saw many treasures that belonged to him in The Armoury of the Kremlin. 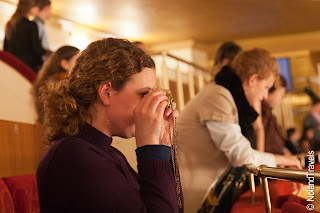 Although it was a long opera (4 hours! 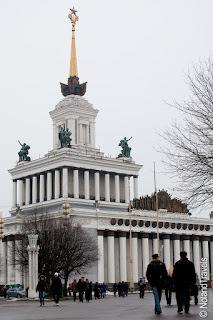 ), it was fitting that it was about Russian history as that made what we were seeing come to life. This wonderful experience for a total of $6! Bargain! It finished after 11pm and we needed dinner but most places were now closed so we topped off our classy evening with pizza and beer from Sbarro Pizza at the underground mall. It was that or McDonalds, so don't judge us too harshly! The snow had really picked up as well, so after our classy dinner we headed over to Red Square to take a few photos and make snow angels! All in all - an awesome night and end to Moscow! 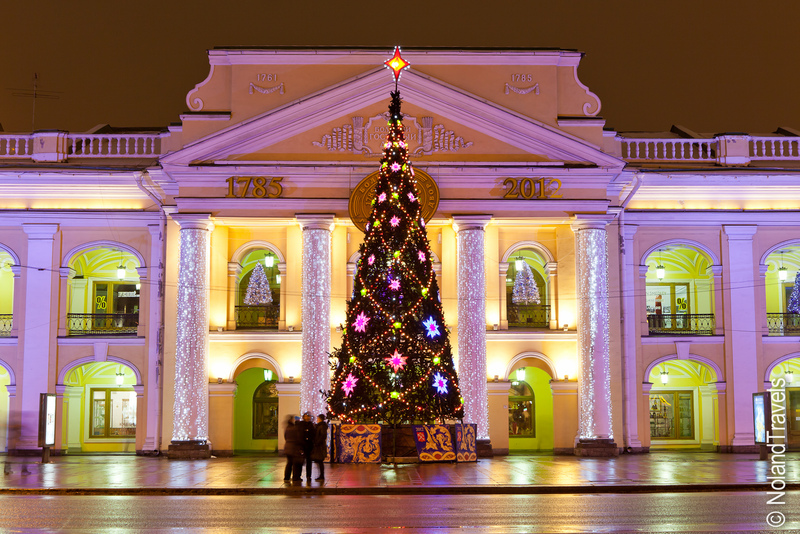 Tomorrow we'd be off to Yekaterinburg! Even though there is enough history, beauty and entertainment to keep you busy around Red Square alone, we did venture a bit further out! 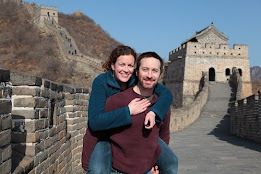 Half the fun of this was using the public transport - their metro system is clean, efficient and has some of the most grand stations you will ever run across. 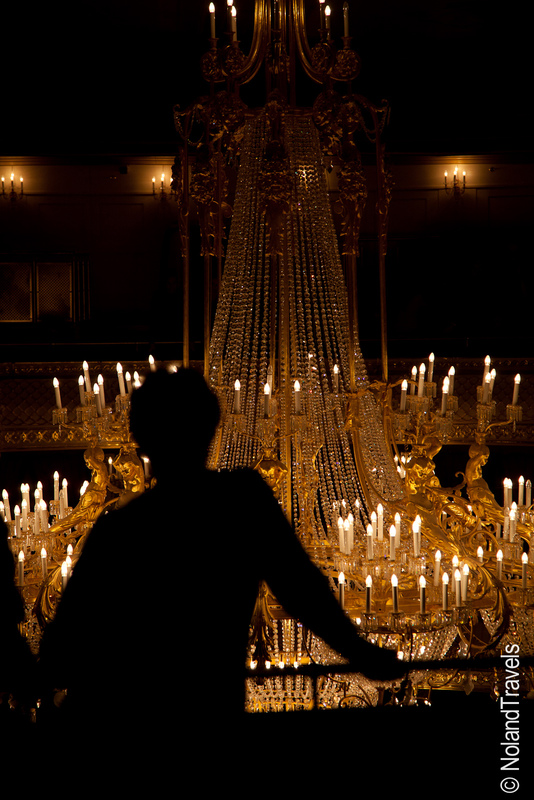 I'm talking chandeliers, paintings, fancy trim, marble and more! While flipping through the list of "things to do" in Moscow we were both intrigued by the Cosmonaut Museum. I attended Space Camp as a kid in Huntsville, AL and Josh and I both have toured the US Space Museum there. 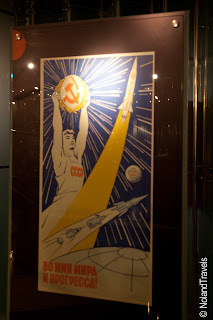 We thought it would also give us good insight on the space race from the other side. The building itself is mainly underground but topped by a huge pinnacle monument with a rocket on top. 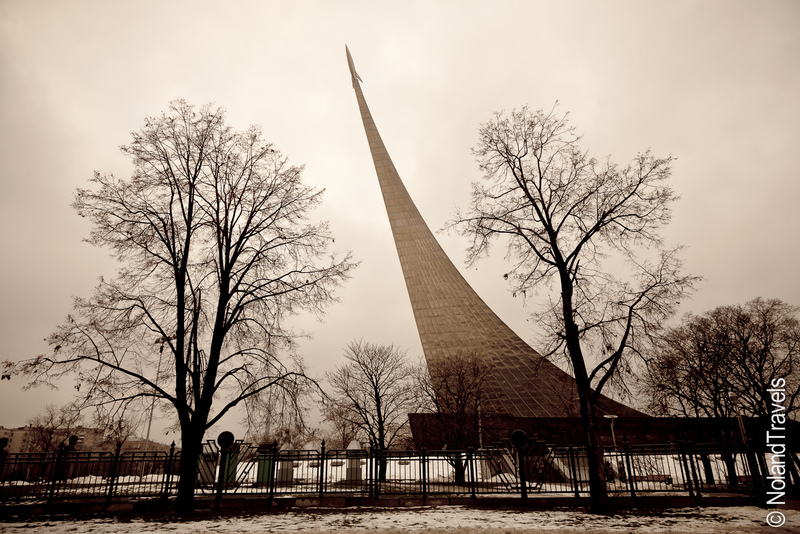 It was opened and dedicated on the 20th anniversary of the first manned space flight. On arrival, Josh was less than pleased to find us waiting in yet another unreasonably slow line in the cold, but he kept entertained by photographing the neat monument above the museum. 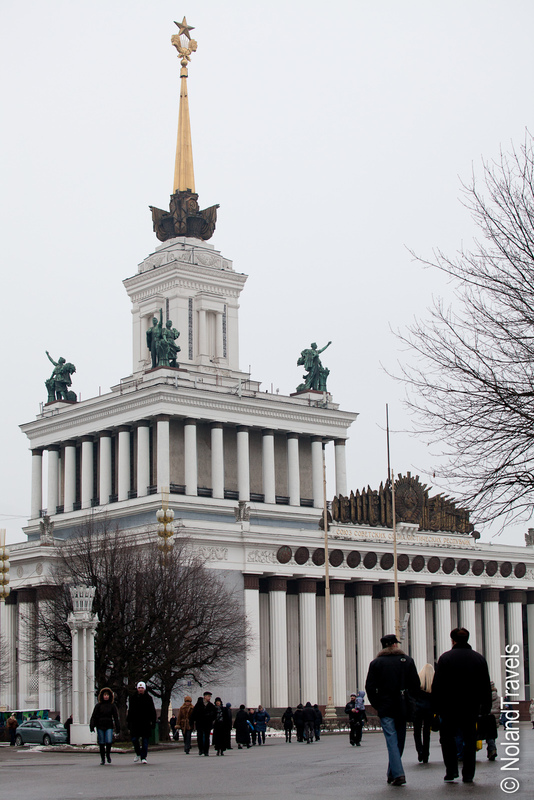 The museum itself was a bit of a let down, mainly because everything was only in Russian. We did recognize a few things including two stuffed dogs that were the first of their kind in space, along with one of the first satellites in orbit and just a generally noticeable progression for space travel and getting to the moon. 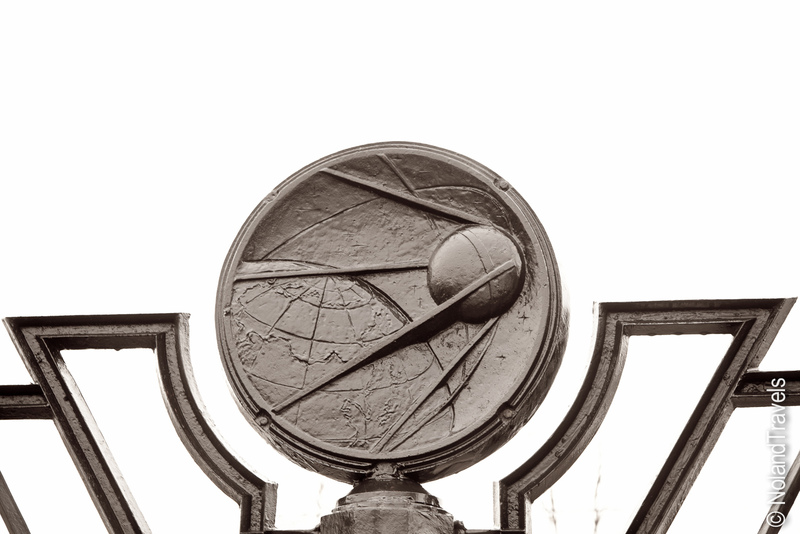 There were a lot of references to NASA which indicated a shared goal which was cool to see. However, we just didn't get the insight we were looking for. We're going to have to read up on it and hopefully that will add more flavor to what we saw. Next door to the Cosmonaut Museum, we saw a stream of people filing in to this large park entrance. After consulting the guide book we found it was something called the All Russian Exhibition Center - described as being built to glorify the ideology of communism and socialism and occupying a mass amount of space. Inside were more than 400 buildings and across a space larger than the Principality of Monaco. We had no idea what we'd find but we had to check it out. It was a serious throwback of times past. 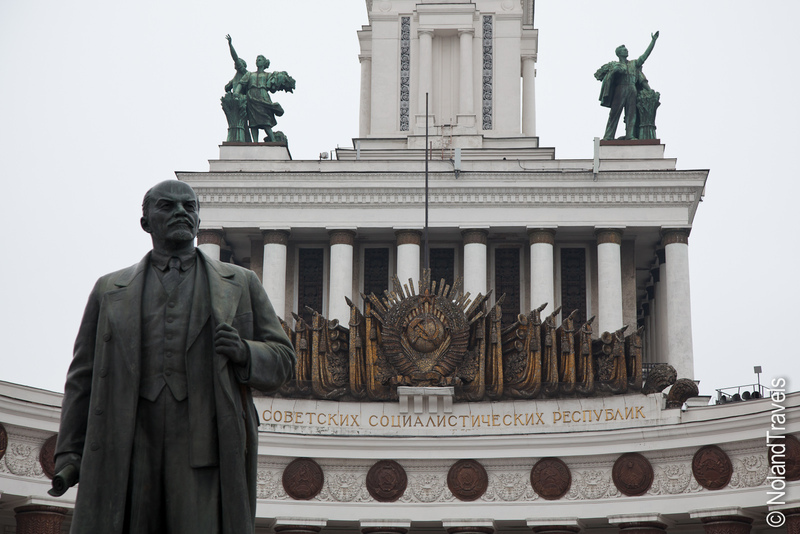 Every building was built in a tribute to some aspect of communism or socialism. From agriculture to engineering to the state itself. The pictures do more justice than words. As it turns out, its actually a permanent general trade show park. Each building has vendors in it offering various things from electronics to fur coats. 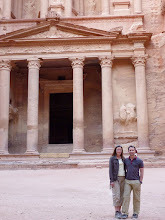 We had good fun going through the buildings; the only useful thing we picked up was a travel sewing kit! Go figure - all that neat stuff and that's all we walked away with! 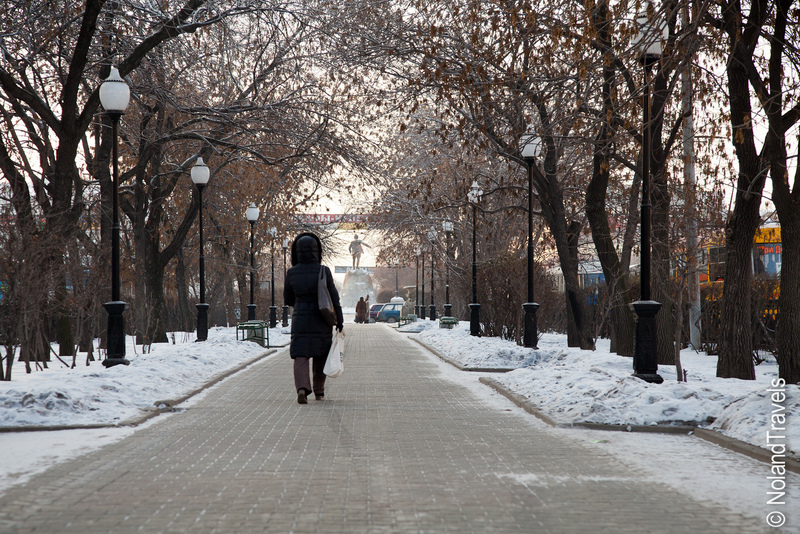 Exploring the park was an interesting look back at the old Soviet Union. 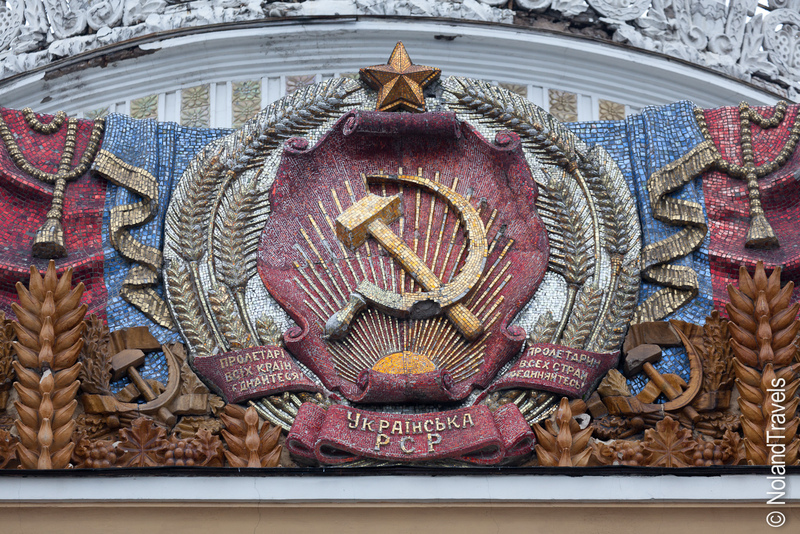 Is it me or is the hammer and sickle embedded in buildings a fascinating piece of history? Anyway it was a good day out trekking through the park, watching the locals (techno music blaring and girls on stilettos on ice) and taking photos of the many interesting buildings. Moscow - Red Square rocks! What is there to say about Moscow's Red Square. Simply, its impressive. After seeing it from photos of world events over the years, it doesn't disappoint. 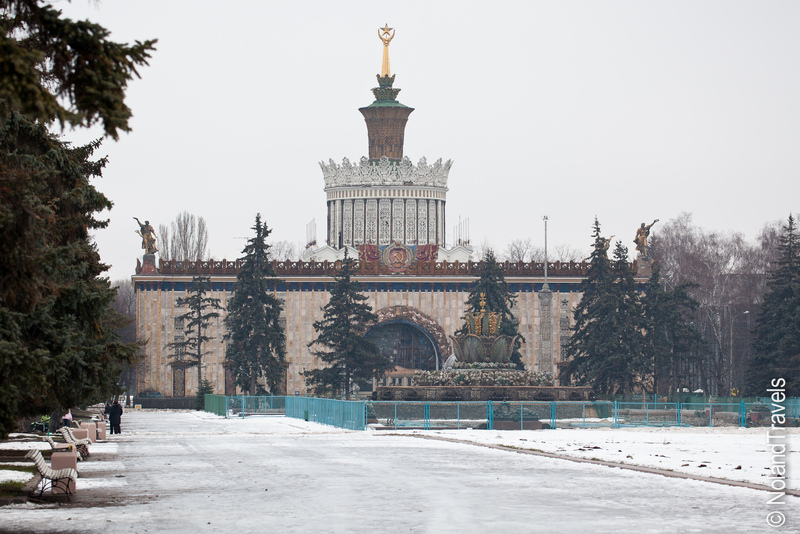 As you enter through the brick gate structure, you immediately see Ivan the Terrible's St. 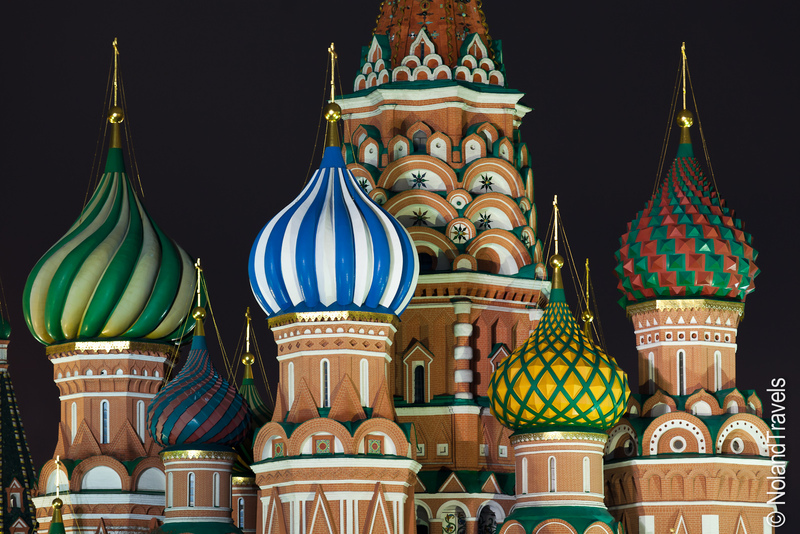 Basil's Cathedral with its unique colored "onion" domes. Some say it's the most recognized building in Russia. 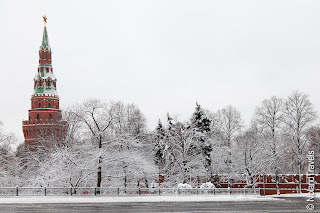 Then your eyes move to the right focusing on the huge red brick wall running the length of the square, guarding the Kremlin with Lenin's soviet era looking square mausoleum sitting at the base. 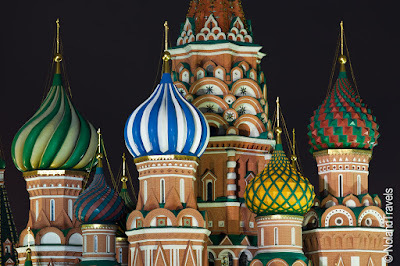 Next, the tall towers at the corners come into focus, with the glowing red stars on top, the taller one with a clock declaring Moscow time. Swinging back left around the square you pass St. Basil's when you notice the long shopping arcade that runs the other length of the square, Gum, outlined in white lights. It has a glass roof and is filled with everything from average food to expensive designer shops (hot tip: tasty and reasonably priced food on the top floor and free clean public restrooms). Finally, moving back towards where you are standing you notice a small cathedral to your left and then the red brick, Gothic style State History Museum on your right. The entire square is paved with a cobblestones. 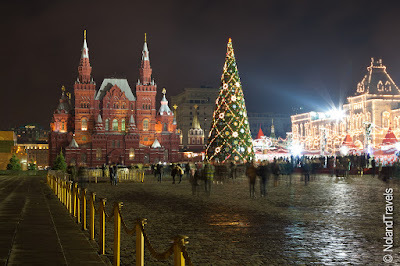 On top of that for Christmas, there was an ice rink and Christmas tree in the center of the square. Very cool indeed! Josh's introduction to Red Square was after my own. In a strange near repeat of St Petersburg, Josh got ill on arrival to Moscow, so I attended our scheduled walking tour alone. That gave me the honor to introduce him to the square that night when he was feeling better and it was twinkling in Christmas lights. The sight definitely lifted his spirits! 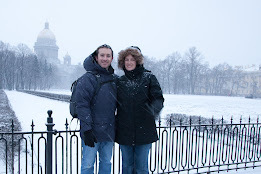 We spent a good deal of our time in Moscow in and around this square - there is literally so much to see! Plus we were lucky enough to see it in a few different conditions and this snow covered shot at the top is one of our favorites. 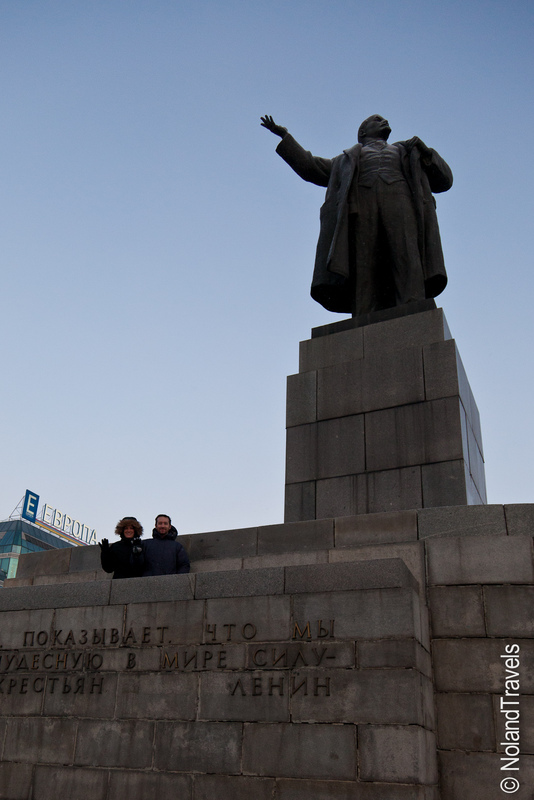 One of the more memorable sights was surprisingly Lenin's tomb. Just getting to see him is tricky business. You are not allowed to take anything in with you. No camera, no water, no bag, no phone, nothing! After handing over almost every object on our person to security we went through metal detectors and a full pat down. It really ups the curiosity factor with this much security...what are we about to see? Sometimes while touring rules can be bent or broken, but not here! There were fully armed military soldiers every 5 feet all making sure the strict rules are followed. You must keep moving, no stopping! Its unbelievably creepy as you descend down the stairs and turn the corner to the cool dark room where the body is displayed, lit by an eerie rosy red light. There is a viewing platform on 3 sides about 5 feet away from where his body lay. Behind glass, there he was, eyes closed in a suit with his arms straight out, hands resting on his waist. You could still see the hairs on his face and the texture of his skin. All fully preserved. The only thing that comes to mind is creepy! And strangely enough, its free to get in but costs money to store your personal belongings for the 10 minutes you are in the tomb and walking the grounds. Not surprisingly, some of the locals are a bit skeptical of the tomb, many thinking the body is a fake. 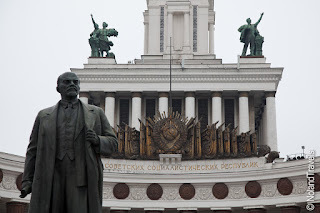 It actually might soon be closed down and Lenin buried as he originally requested. They thought it would have been closed previously but no one wanted to make the decision with upcoming elections (in late 2011 and early 2012). However, many feel its only a matter of time. Are we some of the last people to see him? Who knows - only time and Russian politics will tell. 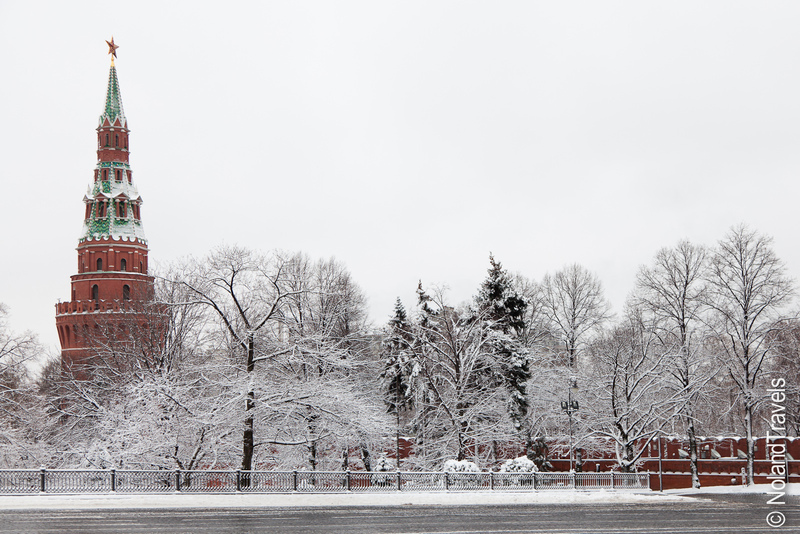 A visit to Moscow wouldn't be complete without visiting the Kremlin. So, we obliged and paid the astronomical entrance fee for foreigners to see The Armoury ($25 per person and that was only for The Armoury section of the Kremlin). 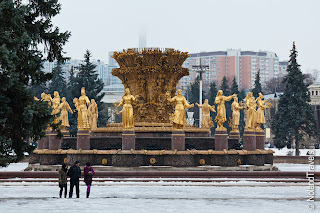 This is where all of the treasures of Tsars past are held. With a fresh coat of glistening white snow, we went through the gates into the inner section of the Kremlin. As you can imagine, housing the nation's most prized possessions, it was done up in true Russian fashion and beyond amazing. Jewelry, china, serving pieces of all sizes, bejewelled Orthodox bibles, ornate furniture, fascinating weapons, armor, lavish fur trimmed regal robes, stunning small-waisted (female) clothing, crowns, septors, thrones, horse-drawn carriages, horse-drawn sleds (awesome, right?! ), carriages for the children and the unforgettable Faberge eggs! I almost had to beg Josh to pay the ticket price but afterwards we were both well and truly impressed! 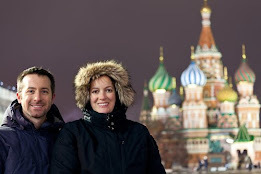 We did venture beyond Red Square - and half the fun was actually getting there on the impressive subway...! Standing in line in Russia is cold! To wrap up St Petersburg a few things come to mind. We really enjoyed the Christmas decorations but weren't big fans of the crowds that came with them. All throughout the city decorations were everywhere which added a lot of color and awe to the city. Big Christmas trees, light poles with decoration and buildings covered in lights. 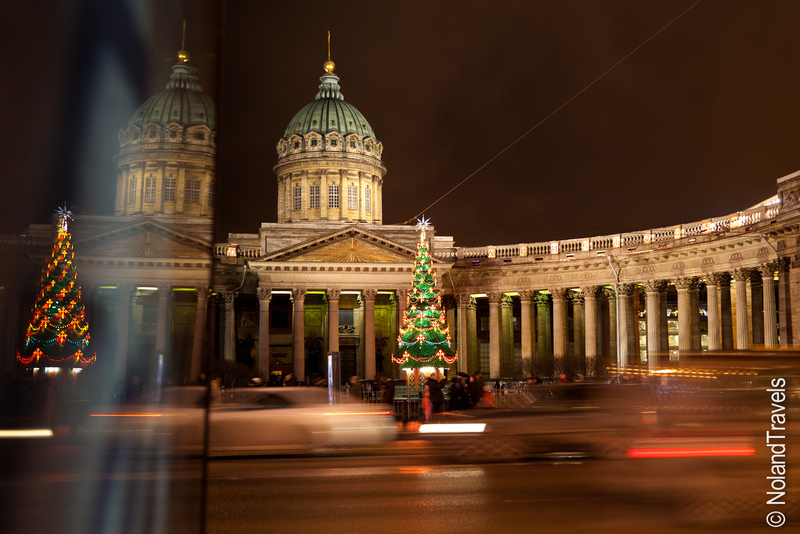 The down side was that the city was bustling with visitors, mostly Russian which lead to long lines at most of the sights. I wasn't very amused. Standing in line in freezing temperatures for hours on end just wasn't what I wanted to do. 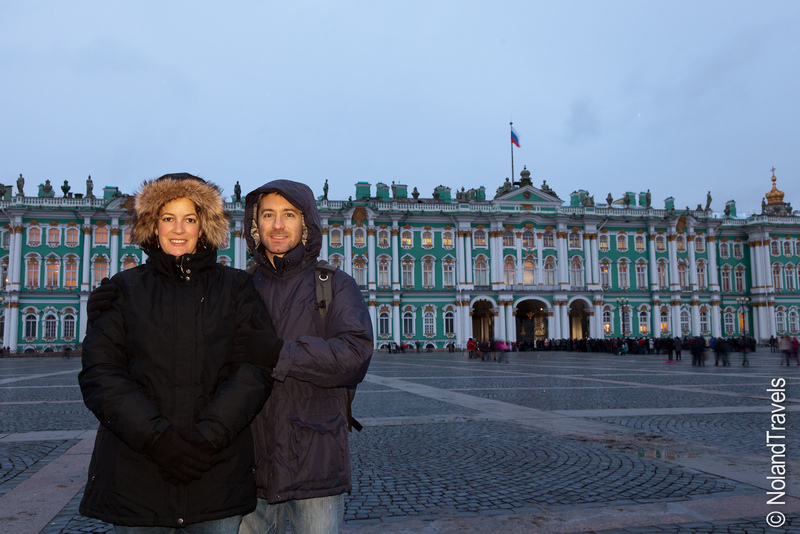 However, Steph ignored my complaining and we visited some of the sights, namely the Hermitage Museum in The Winter Palace (left). Despite the 3 hour line to get in, this turned out to be the right decision because it was stunning! You know the saying, everything is bigger in Texas? 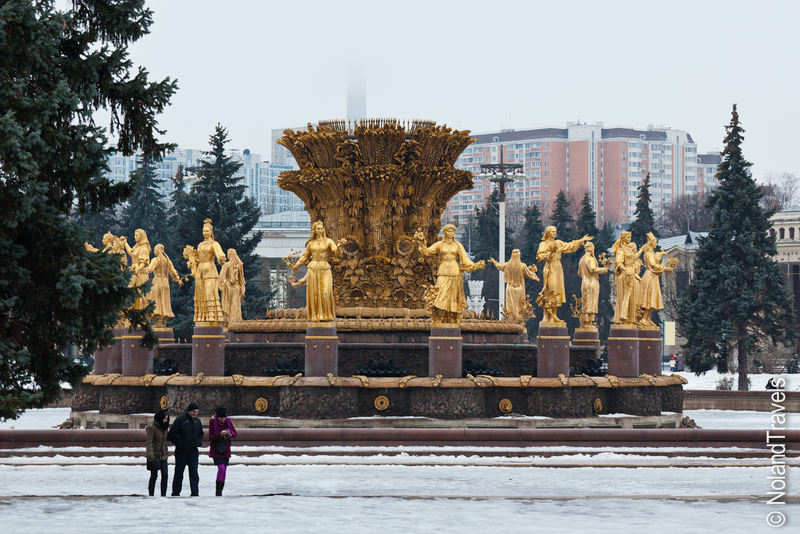 Well everything in Russia is on a monumental scale, in grand Tsar style no less! We've toured some great palaces in our day, but this was on another level. From room to room we went, admiring the huge fine art collection, marbled hallways, gilded columns, ridiculous gold ceilings, gigantic chandlers, and just grand rooms for the sake of having them. Some of you have been to the Louvre in Paris, well, this place is similar in size but every room is better than the last thanks to every Tsar wanting bigger and better than his predecessor! The word "grand" just doesn't do it justice. Sorry but no photos were allowed inside and I couldn't do it justice anyway. So, if you're ever in St Petersburg - put this on your "must do" list, regardless of the line to get in. After the morning visiting the Hermitage, we really pushed my "standing in line" patience limits by also visiting the zoological museum. It has one of the only woolly mammoths ever found with flesh still remaining, thanks to the preservation power of the permafrost ground in Russia. It's actually kind of creepy because it looks like a huge dark leather mammoth just sitting on his back haunches. Other than the mammoth, we saw a stuffed version of pretty much every animal on the planet - crammed in to old and dusty cabinets. Cold line, but still good to see. Here is a photo from Wikipedia. 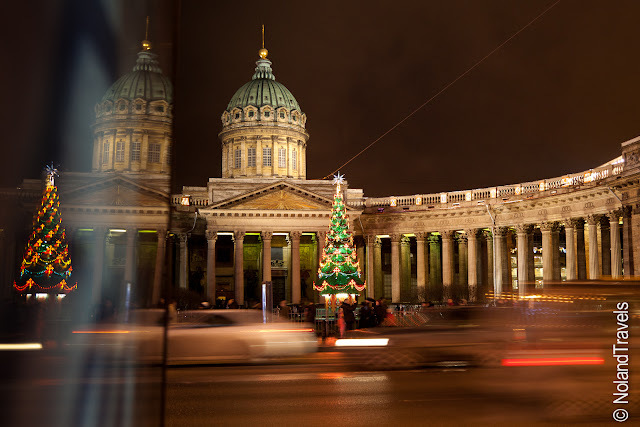 Before I go, a few more things on St Petersburg for future visitors. We can confirm the reports that food and drink are expensive. Prices seemed to be on par with or maybe slightly more expensive than London. Not surprisingly, wine was particularly expensive since it was mostly imported. 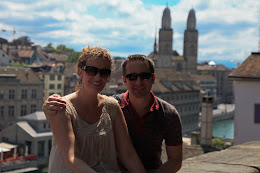 That meant we had some frustrating walks in the cold trying to find menus we could read and prices that suited us. Be aware that lunch time is more of a set window than you may be used to. One day for lunch by the time we decided to start looking for food, we were too late. 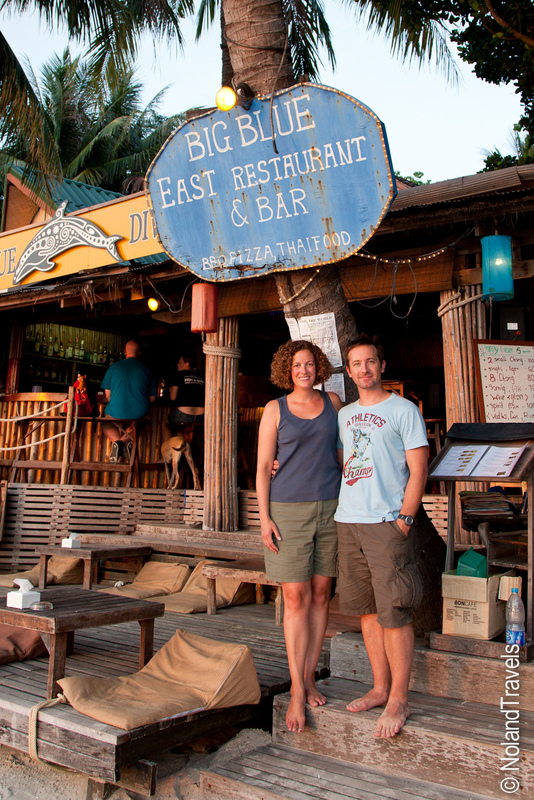 We found out that many local restaurants, the places you want to eat at, actually stop serving during the few hour period between lunch and dinner. Funny enough, we ended up at McDonalds - possibly the busiest McDonald's we've ever seen - I guess everyone else was either late like us or watching the food budget! After waiting for a table to free up, the lunch and the respite from the cold really hit the spot. Along with the Big Mac and fries! We also found some interesting food venues. Remember everything in Russia being on a grand scale? Well restaurants are no exception. 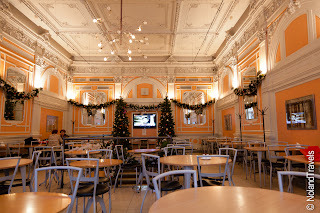 The above photo was a simple cafe we choose for lunch. 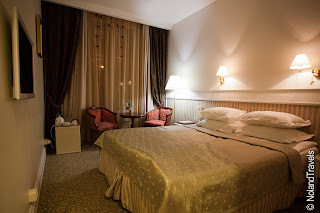 Even when asking our hotel for a simple nearby restaurant for dinner one night, we found it decked out out with shiny marble floors, brass light fixtures and lavish curtains - and it was reasonably priced! 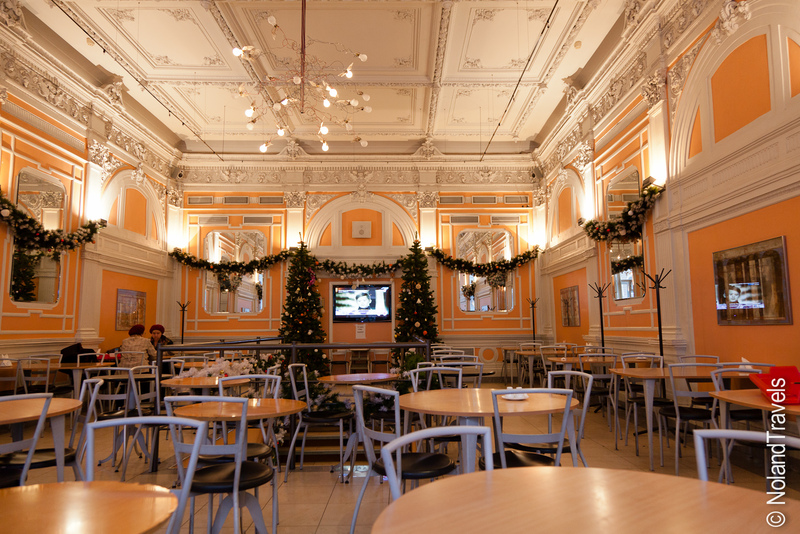 We also went to an Italian restaurant with a grand staircase; we ate on one of the staircase landings while watching Roman Holiday projected on the wall. Loved it! Finally, here are a few more photos of the grand decorated buildings of St. Petersburg. Kinabatangen River - Old men in the jungle!